Looking for ideas to build a nest for your guests? 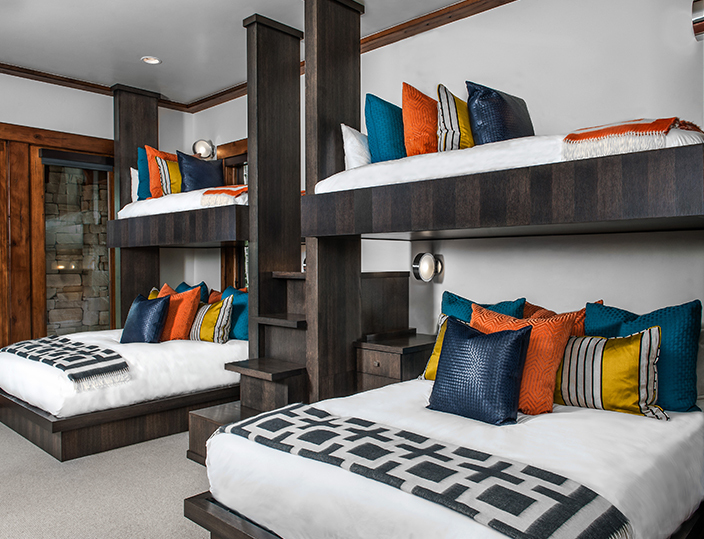 Bunk rooms have become ubiquitous in vacation homes — not only for kids, but adults too. What is it about bunk rooms that is so engaging? Perhaps they bring back happy memories of sharing bedrooms with siblings (fights forgotten), summer camp, slumber parties, ghost stories, whispers, and giggles. We all have a little spot in our imagination of what the best slumber party ever looks like, and it likely has some kind of bunk bed or canopy-covered cozy spot. The trend is prevalent at Long Cove, the knockout lakefront real estate community on Cedar Creek Lake we’ve shared news of as stages unfolded. The project is being developed by Don McNamara, well known in Dallas for projects such as CityPlace and West Village. With shared amenities and a full range of services similar to second home communities such as Watersound and Seaside in the Florida Panhandle, Long Cove is a convenient and carefree place to relax just one hour south of Dallas. The premise: 1,100 acres of luxury lake housing with more than 6 miles of shoreline, a community knit together with shared amenities (a convenient marina, boat shop, pool, golf, and playing fields and courts for all sorts of sports and activities); concierge services to take care of the work that goes into the care and maintenance of a home and boat — all within easy driving distance from Dallas-Fort Worth. Residents here tend to be multi-generation families gathered to share weekends and vacation time under one roof. Space to sleep many counts here; hence the appeal of the bunk rooms. There’s a friendly bit of competition as to which designer comes up with the best bunks — it even has its own page on Long Cove’s community website. In the race for the best bunkroom, Long Cove shared photos of these slumber party-ready spots. These fun nooks are tricked out with cool storage compartments, clever ladders, and tech-friendly USB ports. Many adjoin media or game rooms furnished with flatscreens, video game setups, and billiard tables. Have a gander, and smile with us, at these inviting heartwarmers and tell us: Which bunkroom is your favorite?